Miracles, miracles, miracles! Your material needs are fulfilled in magical and unexpected ways. Acts of kindness are bestowed upon you. It is a valuable time to give and receive with a grateful heart. You are always provided for, supported and taken care of by the Universe. As you receive, receive thus with a grateful and open heart. Give to others in need without asking for anything in return. We can give of ourselves in different ways, energy, time and self-development gifts. Pennies from Heaven all around! Dear God thank you, thank you, thank you for the miracles and blessings bestowed upon us. I am deeply grateful for the sun shining upon our life during this time! 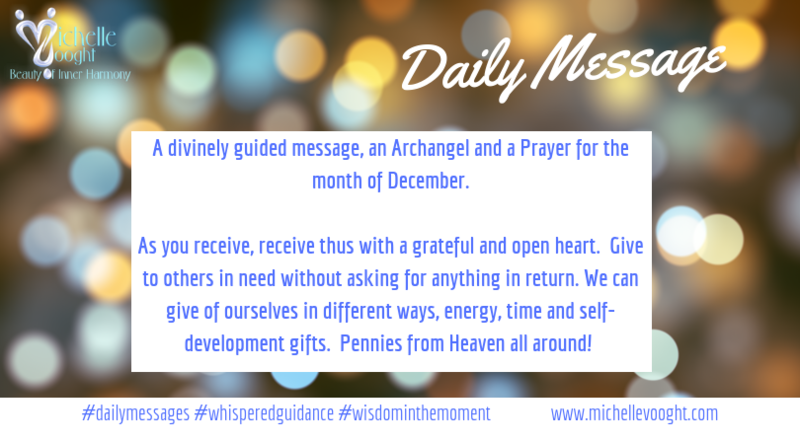 Archangel Uriel, please open my mind to receive an abundance of ideas and epiphanies so that I may thrive and inspire everybody around me too! Thank you for the blessings of life, the rewards for hard work and happy times. I ask that all those in need may be provided for and supported during this time and I bless them. Thank you, thank you, thank you. Amen.